P.J. Ellis Electric is committed to the safety of its employees. Nothing is more important to us and we take the responsibility of a safe work environment very serious. We urge every one of our employees to understand the importance of observing the safety guidelines and policies of our company for their own protection as well as the protection of their coworkers on the jobsite. P.J. 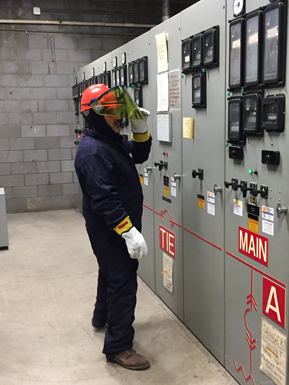 Ellis Electric complies with all applicable OSHA rules and regulations for the State of Ohio. In addition, we follow The National Electrical Code NFPA 70 for safety standards. Our Project Managers utilize the NECA Safety Meeting App which is a new innovative way to manage workplace safety more effectively. P.J. Ellis Electric participates in the Construction Safety Council which promotes safety in the construction industry through educational activities and provides a forum for safety and health information and networking. We attend monthly safety conferences on various topics regarding the electrical industry. P.J. Ellis Electric has actively participated in the Drug Free Safety Program with the Ohio BWC for over 13 years. Furthermore, we have applied and received a Safety Intervention Grant from the Ohio BWC. And we continue to do so in an effort to reduce and eliminate workplace injuries by purchasing equipment that will remove these exposures to the employees.